• 1957: California Correctional Officers Association (the predecessor to the CCPOA) is founded. • 1973: The CCOA reaches 3,200 members. It is still dwarfed by the 102,000 member California State Employees Association. • 1976: California becomes the second state after Maine to abolish indeterminate sentencing, which had explicitly embraced rehabilitation as a correctional goal and tied a prisoner’s release date to his or her rehabilitative progress. • 1978: Gov. Jerry Brown signs the Dills Act into law, giving public employees collective bargaining rights. • 1980: California has 12 prisons. Prison guards make approximately $21,000 per year. • 1980: Don Novey takes over as president of CCPOA; although no longer working in a prison, Novey continues to receive his $59,900 salary, in addition to his new $60,000 union chief salary. • 1983: By the end of Jerry Brown’s term as governor, total prison population increases by 9,899, from 24,471 to 34,640. • 1983: CCPOA successfully negotiates a 2.5% at 55 retirement package. • 1984: CCPOA membership swells to 10,000. • 1990: CCPOA contributes $1 million to Pete Wilson. • 1990: The CCPOA contributes over $80,000 to an unknown opponent of Senator John Vasconcellos, D-Santa Clara, who led opposition to a prison-building bond as an assemblyman in 1990. The much more visible Vasconcellos only narrowly defeated the unknown CCPOA-backed candidate. • 1991: By the end of George Deukmejian’s term as governor, total prison population explodes by 62,669, from 34,640 to 97,309. The Corrections’ share of the General Fund saw an 81% increase over the past 8 years. • July 1993: The CCPOA is one of the top 10 state political campaign contributors with more than $1 million in contributions, substantially to Republican candidates, including a challenger to an assemblyman who had repeatedly called for slowing growth in prison operating budgets. • 1992: Prison guards’ pay averages $45,000 per year. • 1994: With the help of CCPOA’s $101,000 support, Californians passed Proposition 184, the nation’s toughest three-strikes law mandating 25-years-to-life sentences for most felony offenders with two previous serious convictions. • 1995: States around the country spend more building prisons than colleges for the first time in history. • 1998: Don Novey, president of the CCPOA, contributes $2.1 million to the Gray Davis campaign. • 1998: The CCPOA donates a total of $5.3 million to legislative races, the Gray Davis campaign, and voter initiatives. It was the No. 1 donor to California legislative races at $1.9 million. It contributed $2.3 million into Davis’s campaign, placed television spots for Davis in the conservative Central Valley, and helped fund a bank of telephone callers before the election. The CCPOA contributed $3 million to Gray Davis during his term in office. 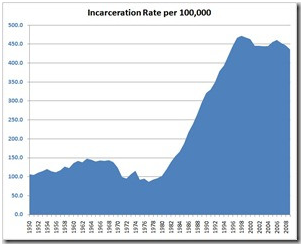 • 1998: Since approximately 1980, California tripled its number of prisons and increased its inmate population to nearly 160,000 at 33 prisons and 38 work camps. • 1998: Gov. Pete Wilson, who receives $1.5 million in CCPOA contributions in 1998, vetoes pay raises for other state workers while CCPOA members obtain a 12% pay increase, bringing top pay from $46,200 to $50,820. State university instructors earn between $32,000 and $37,000. By the end of Pete Wilson’s term as governor in 1999, total prison population increased by 67,875, from 97,309 to an estimated 165,166. • 1999: After the Legislature approves a bill to establish a $1 million pilot program to provide alternative sentencing for some nonviolent parole offenders—estimated to save taxpayers $600 million a year—the CCPOA opposes the bill. Governor Gray Davis then vetoes the bill. The CCPOA also persuades Gov. Davis to close three privately run prisons, even though they housed inmates at substantially lower costs than state-run facilities. • 2000: The CCPOA contributes at least $75,000 to the opponents of Proposition 36, the 2000 initiative that replaced incarceration with substance abuse treatment for certain nonviolent offenders. • 2002: CCPOA contributes $1 million to Gray Davis’s campaign. The CCPOA contributes $200,000 to defeat Assemblyman Phil Wyman in 2002, an advocate of private prisons. The CCPOA negotiates an increase to prison guards’ pay estimated between 28% and 37%, at a price tag of $500 million per year. Senior guards earn $52,700 a year, compared to $30,000 for a senior supervisor in Texas. The California Legislature approves $170 million in extra prison spending. In addition to granting correctional officers a major boost in pay, the labor pact permitted officers to call in sick without a doctor’s note confirming the illness. With the new policy in place, prison officers called in sick 500,000 more hours in 2002 than in 2001, a 27% increase. “Our overtime would have been below 2001, or real close, had it not been for that 500,000-hour increase,” said Wendy Still, the main budget analyst for the Department of Corrections. Corrections officers called in sick 27 percent more often last year than they did in 2001, for an additional 500,000 lost hours. More than a third of the overtime logged last year was to compensate for guards who called in sick, according to the Bureau of State Audits. The California Department of Finance requests $70 million to cover unexpected prison costs from 2001. In December, Gray Davis asks lawmakers for $10 billion in emergency cuts to other state programs. • 2003: Gray Davis asks the Legislature to approve another $150 million for prison system’s budget. The CCPOA contributes $25,000 to Senate President Pro Tem John Burton, a San Francisco Democrat, three months after giving $12,000 to Senate Republican Leader Jim Brulte of Rancho Cucamonga. CCPOA members receive a 7% raise, pushing average annual take-home pay to $64,000. California’s prison budget is estimated at $5.2 billion. • 2004: The CCPOA spends over $1 million to defeat Prop 66, the initiative that would have limited the crimes that triggered a life sentence under the Three Strikes law. • 2005: The CCPOA defeats Governor Schwarzenegger’s plan to “reduce the prison population by as much as 20,000, mainly through a program that diverted parole violators into rehabilitation efforts: drug programs, halfway houses and home detention.” Spending on California’s penal system constitutes approximately 7% of the state’s general funds. CCPOA membership reaches 26,000. • 2007: Following a 2007 ruling requiring the state to fix its prison overcrowding problem, the Legislature passes a $3.5 billion bond package to finance the construction of new prisons, yet four years later not a single new facility has been built. • 2008: The CCPOA contributes $2 million to Jerry Brown’s gubernatorial campaign. The CCPOA contributes $1 million against Prop 5, a measure to reduce prison overcrowding by providing treatment rather than prison sentences for nonviolent drug users. • 2011: Gov. Brown’s proposed Fiscal Year 2011-2012 budget funds the prison system $9.19 billion, nearly 7.2% of the entire state budget. It costs an average of $44,563 a year to house each of California’s approximately 158,000 inmates in a system at roughly 200% of capacity. The national average is $28,000. By 2011, CCPOA members are among the most generously compensated public workers in the state, even while their union resists policy changes to bring prison overcrowding, recidivism, and costs under control. As observed by Rich Tatum, a 33-year prisons veteran and president of the California Correctional Supervisors Organization, “It does seem at times like the union is running the department.” John Irwin, a retired professor and commentator of California’s correctional system, worries that “the wardens don’t feel they have much control of what goes on. The cliques – mostly led by sergeants – at the prisons are very strong, and the union, of course, backs them up when they get into trouble.” That the CCPOA effectively wields so much governmental power explains how the misconduct of their members goes unchecked, and reported sexual assault, unreasonable use of tasers and pepper spray, hitting with flashlights and batons, punching and kicking, slurs and racial epithets, among others, go uninvestigated. According to the 138-page opinion in Madrid v. Gomez, 889 F. Supp. 1146 (N.D.Cal. 1995), “The court finds that supervision of the use of non-lethal force at Pelican Bay is strikingly deficient,” and “It is clear to the Court that while the IAD [Internal Affairs Division] goes through the necessary motions, it is invariably a counterfeit investigation pursued with one outcome in mind: to avoid finding officer misconduct as often as possible. As described below, not only are all presumptions in favor of the officer, but evidence is routinely strained, twisted or ignored to reach the desired result.” The court held that the prison guards and officials engaged in unnecessary infliction of pain and use of excessive force, and violated the Eighth Amendment, among other things. According to testimony in Madrid, from 1989 to 1994 officers in California’s state prisons shot and killed more than 30 inmates. By contrast, in all other state and federal prisons nationally only 6 inmates were killed in the same period-and 5 of those were shot while attempting to escape. Compounding this misconduct is the systemic lack of transparency preventing the public from knowing the full extent of the guards’ abuses. Union members, for example, employ a “code of silence” to squelch evidence of misconduct: Even if the CDC were more thorough in its investigation of officer misconduct, it would have to overcome the membership’s last line of defense-a widely accepted code of silence. In the Madrid case, Judge Henderson referred to the “undeniable presence of a ‘code of silence’ … designed to encourage prison employees to remain silent regarding the improper behavior of their fellow employees, particularly where excessive force has been alleged.” 889 F Supp at 1157. Novey, asked in the 1998 state Senate hearings if he would say such a code existed, replied, “I wouldn’t totally say that…. But I will attest that there are pockets [of the code], and our job’s to help weed out those pockets.” As the Madrid ruling chillingly observes, “Certainly, much has transpired at Pelican Bay California state prison of which the Court will never know.” Concurrent with the abuses described in Madrid, similar abuses were under investigation at Corcoran State Prison concerning guards using firearms to break up fist fights: The investigations at Corcoran State Prison eventually led to the federal indictment of eight officers for allegedly staging “blood sport” fights between inmates that occurred in the security housing unit in 1994. Before the trial, the CCPOA financed an infomercial in 1999 about the tough working conditions at Corcoran. Thomas E. Quinn, a private investigator in Fresno who produced a documentary video showing some of the fights, says the union’s infomercial showed “prison guards as neighbors, and prisoners as the scum of the earth.” Broadcast by local television stations prior to jury selection, the ad concluded with the tag line “Corcoran officers: They walk the toughest beat in the state.” Although prosecutors expressed concern about the ads to the trial judge, they didn’t attempt to stop the broad-casts. The jury eventually acquitted the eight guards of all charges. Immediately after the verdict, some jurors joined the defendants for an impromptu celebration. Tame by comparison, the investigation earlier this year into prison guards who smuggled 10,000 cellphones to inmates in 2010—including one guard who obtained $150,000 through the illegal practice—hardly made a blip on anyone’s radar. Nor did this or the union’s many other abuses prevent it from successfully negotiating a vacation benefits package with Gov. Brown recently for, among other perks, eight weeks of vacation per year, additional time upon gaining seniority, and the right to cash out an unlimited amount of accrued vacation time upon retirement at final pay scale. Although the CCPOA insists the deal simply pays its members for the vacation days they were unable to take due to staffing shortages, the CCPOA itself is a significant contributor to the overcrowding and budgetary constraints that led to these shortages. As a result of the overcrowding and dismal conditions in California’s prisons, the U.S. Supreme Court in Brown v. Plata recently ordered the state to reduce its prison population to 137.5% of design capacity by releasing approximately 37,000 prisoners. For California to comply with the high Court’s order, however, it must contend with a prison guards union at the height of its power. The state, on the one hand, must negotiate under a strict time table set by the Supreme Court while observing the constitutional protections of its prisoners and the interests of the public. The CCPOA, on the other hand, has the power to oust those elected officials who fail to put the union’s interests first. It’s a dangerous stand off, set in motion in part by Gov. Brown himself with the Dills Act in 1978. There is some poetic justice that, more than three decades later, it is Brown who must confront the powerful special interest he helped create. From Ordinary Times ~a group blog of politics, culture, and other various ramblings.